The Check Point 700 Appliances deliver enterprise-grade security in a simple, affordable, all-in-one security solution to protect small business employees, networks and data from cyber-theft. This one device offers integrated, multi-layered security; Firewall, VPN, IPS, Antivirus, Anti-Bot, Application Visibility & Control, URL Filtering and Email Security - all in a quiet, compact desktop form factor. The 700 Appliance runs the same industry-leading security that is used to secure Fortune 100 companies. Small companies face the same Internet attacks as large enterprises. The Check Point 700 series appliances have the industry’s highest-ranked next generation firewall, antivirus, anti-bot, IPS and threat prevention security technologies to deliver protection against cyberattack. Protect your company from modern-day threats with Check Point enterprise grade security in a simple product designed for SMB. The 700 series appliances come standard with 6 x 1Gbps Ethernet ports. Standard integrated Wi-Fi access provides Internet access for laptops and BYOD devices. The Check Point 700 series appliances are simple to manage by small companies with limited IT staff and can be configured and deployed within minutes. Download the Check Point 700 Appliance Datasheet (PDF). 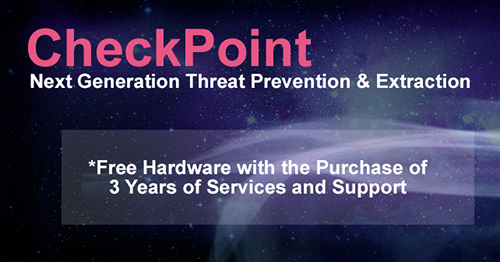 Download the Check Point Small Business Appliance Brochure (PDF).